The Prairie Tent Caterpillar (Malacosoma Californicum Lutescens) is mostly found in chokecherry, plum, willow, ash, poplar, and rose trees. Mature larvae are 50 mm long and can be quite variable in pattern. In general, most prairie tent caterpillars are pale blue with an interrupted white stripe bordered by two reddish-orange stripes down the center of the back. Eastern tent caterpillars (Malacosoma Americanum) are similar but have a continuous white stripe down the back and black heads. Moths of both species are reddish-brown, have two oblique whitish stripes on the forewings and have a wingspan of 37 to 50 mm. Eggs hatch when the first new leaves appear. 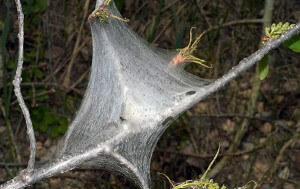 Larvae live in colonies and construct large silk tents around a fork or branches of trees. These tents are enlarged as the larvae grow, enclosing the entire branch or even the entire tree. Adults of prairie tent caterpillars emerge in late summer (August in Nebraska) and lay flat egg masses on twigs and branches. Adults of eastern tent caterpillars emerge in June and early July. There is one generation per year. Larvae skeletonize leaves outside tents. Infestations tend to be spotty and are often unrecognized until entire trees have been defoliated. Severely infested trees are less vigorous and unsightly, but are rarely killed.